African-Americans are more likely to support increased immigration in the U.S. than non-Hispanic whites, says a new poll from Gallup. Around 30 percent of blacks support more immigration in the U.S, compared to just 21 percent of whites, according to the study, which had a ±5 margin of error. The latest national polls conducted by Gallup that were not race specific indicate that a majority of Americans support increasing immigration levels (25 percent) or maintaining them at current levels (40 percent), while a sizeable minority want to see immigration numbers drop (34 percent). Normally, sample sizes of minority groups in Gallup’s national surveys are too small to have a smaller margin of error. In the latest poll, over 800 African-Americans and whites were asked about their immigration views. The poll comes at a time when African-Americans are being increasingly evoked in the immigration debate. Here’s a sampling of what current presidential hopefuls have said about black unemployment, legal status for immigrants and immigration in general. Most of them are white. "[Black teenager Jamal Shaw] should be someday in the NFL, but he won't be, because an illegal immigrant shot him, violently." Dr. Ben Carson, a black GOP presidential candidate has called for tougher immigration enforcement, as well as changes to the current worker visa program. As far as we could find, he doesn’t evoke black unemployment though. He outlined his immigration proposal in the National Review in November of 2014 . Jason Nichols, a lecturer in the African American studies department at the University of Maryland College Park, recently wrote an op-ed calling Trump’s rhetoric a scare-tactic, and decrying disunity being advocated by American politicians. African-American views on immigration and legal status are far from monolithic. Tension over immigration is not new for the African-American community and leaders are often divided. 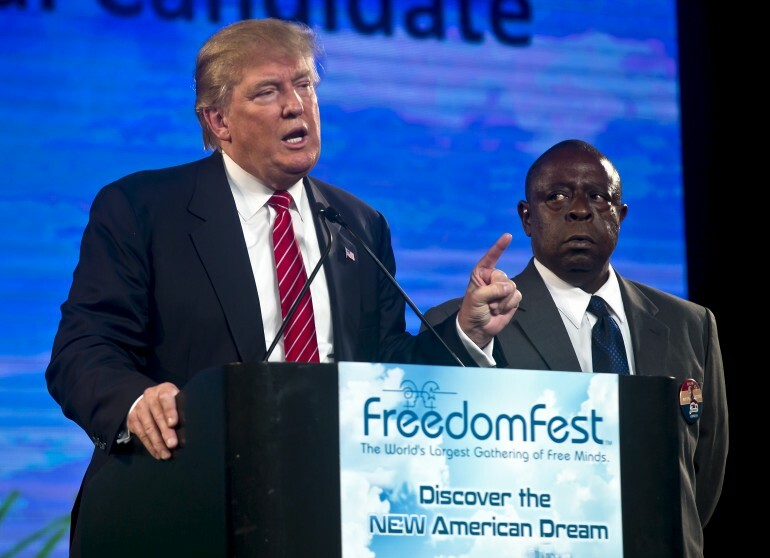 In 2013, the Black American Leadership Alliance argued against a comprehensive immigration bill arguing that it would be bad for the African-American workforce. In an interview with U.S. News and World Report , Congressional Black Caucus member Rep. Yvette Clarke, D-N.Y. disagreed, supporting legal status for immigrants that are in the U.S. illegally. "African-Americans don't live in a vacuum and will greatly benefit by the full integration of undocumented and out of status population," Clarke said.